"Laurie has provided much more than the average advertising agency would – she has been a partner in the business." When John Buccheit bought Viking International just after 9/11 he was a young, 30-something, new furniture store owner. 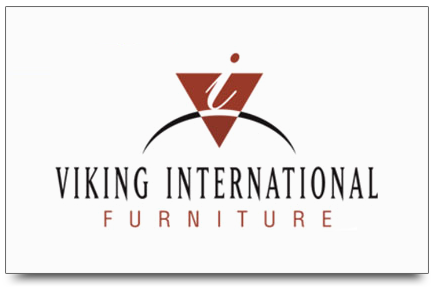 Viking International Furniture had been owned locally for 20 years. Their primary marketing vehicle had been radio. With an MBA in marketing, John knew partnering with the right team would lead to more effective marketing and advertising decisions. Our first objective was to update the store brand. The brand represented teak furniture. It was antiquated and didn’t reflect the contemporary feeling and products in the store. We developed a tagline, created a new logo and produced three image ads for television. Other initial objectives included building a website, installing a computer inventory system and upgrading the sales staff. We used image television to bring the store into the home so viewers could picture contemporary furniture in their own home. We also produced TV spot to advertise the new website. With all of these changes we were able to double the business in just few short years. As the business and consumers markets have changed dramatically since 2001, our strategies have changed as well. Viking moved to Eastview Mall in 2004 creating the most beautiful furniture store in the Rochester/Ontario County area. The move enabled them to be nearer to upscale shoppers and their competition. We have needed to add far more promotional events. Television continues to move the needle the most. We have changed the look of our ads with different approaches every 2 to 3 years to keep them fresh and to change with the ever changing marketplace. While other single, locally owned furniture stores have closed, Viking remains competitive and has weathered the economic storms well. Viking International Furniture has utilized the agency services of Sundance Marketing for the past 6 years. During that time, Laurie Sagona has played an integral role in all Marketing activities at Viking. She has been involved in decision making on strategic issues such as re-branding Viking through various advertising and public relations initiatives. She also has been actively involved in numerous tactical issues such as budgeting and media placement. Laurie has provided much more than the average advertising agency would – she has been a partner in the business. She has made our business her business by striving to always be aware of current conditions and reacting to those conditions to achieve results. She has greatly contributed to the success of Viking over the past six years and has been a pleasure to work with. John Buchheit President, Viking International Furniture, Inc.